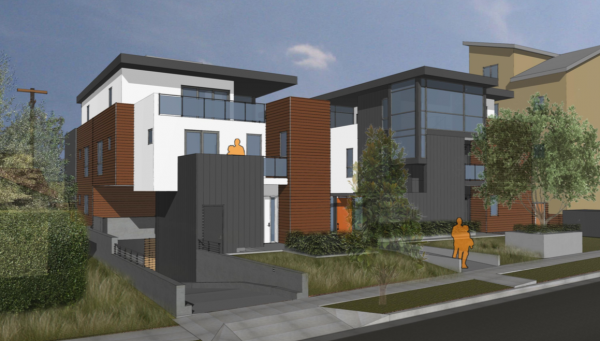 The West Hollywood Planning Commission on Thursday will consider proposals by developers to demolish a total of four single-family homes and replace them with three buildings that will house condominiums and one that will contain apartments. Illustration of 944 Ogden Drive facade of a project stretching to 947 Genesee Ave. (The Code Solution architects). One project consists of three buildings – one fronting 947 Genesee Ave., the other fronting 944 Ogden Drive and the third sitting between those two. Each of those buildings will be three stories high. They will contain a total of 10 units with 23 parking spaces in two underground parking garages accessible from Genesee and Ogden. That project’s developer, Ilan Kenig’s FMB Development, decided to pay into the city’s Affordable Housing Trust Fund rather than include affordable housing units in the projects. The two houses that will be torn down currently are empty. The planned condo units range in size from 1,121-square-feet to 1,690-square-feet. All units include three bedrooms and three and a half baths. Each unit will include private open space within balconies on the second and third floors and a private rooftop patio. The architect is The Code Solution of Los Angeles. The developer has agreed to dedicate an easement along both the Genesee Avenue and Ogden Drive frontages to accommodate a ten-foot sidewalk and landscaped parkway along both streets. The other project is on two lots at 1011 and 1015 Crescent Heights Boulevard that the developer proposes to join into one lot. It involves the demolition of two single-family homes for the construction of a three-story, 12-unit apartment building over one level of underground parking with 20 spaces. The developer of that project is a Delaware-registered limited liability company that is associated with Paradigm Developers in Los Angeles and the architect is Modative of Culver City. Seven of the apartments would have two bedrooms and the remaining five would be one-bedroom units. One unit will be reserved for a low-income tenant. The units range in size from 603 square feet to 1,190 square feet. The houses that would be demolished currently are unoccupied and not on the city’s list of rent stabilized properties. The house at 1011 Crescent Heights is a “Craftsman Colonial Revival” style structure that was built in 1922. The house at 1015 Crescent Heights is a Spanish Colonial Revival style structure that was built in 1923. The project would consist of two apartment buildings with a courtyard between them. The entrance to the parking garage would be on Crescent Heights Boulevard. The development team for another project at 939 Spaulding Ave. has asked that its presentation before the Planning Commission, originally scheduled for Thursday, be postponed. The Planning Commission will meet at 6:30 p.m. on Thursday at the City Council Chambers, 625 N. San Vicente Blvd. Free parking is available in the five-story structure behind the chambers with a ticket validated at the meeting. Entirely predictable. One conscious, qualified member of the Planning Commission and seat warmers that have shown no evidence of advancing their own knowledge. A dismal project that will now along with others will pass muster without review contributing to a repeat of the banal proliferation of projects constructed in the 60’s with zero architectural value. Again Commissioner Altschul bloviates and junior commissioners tag along. Depressing outcome. Please Mr. Altschul retire your ego , it is not relevant in this endeavor. These two projects represent a failure of the Design Review to grasp their mission. FMB continues to submit projects of little aesthetic awareness or connection to the surrounding neighborhoods but as a financial widget producing company they press on. Both these projects represent “C+” aesthetic value as they appear to be designing in a vacuum. With effort and knowledge big improvements are possible. I have no objection to the size and idea of the second building. At least, yet. For every available unit removed from the market where a fee is paid into the fund, how many years does it take before another building replaces that one unit? What is the value of the fee over the time it takes to build the replacement? How are we doing on affordable housing, WeHo? Not very well, I imagine.